The sub-Saharan Africa rail revitalisation project that is rehabilitating and upgrading vital railway networks in Southern African Development Community (SADC) is surging ahead using storage containers for rent, particularly in the north-south corridor that runs from Durban through Zimbabwe and Zambia to the United Republic of Tanzania and the Democratic Republic of Congo (DRC). The project incorporates two other corridors, east-west that links Namibia, Botswana, and Lesotho to South Africa, and the Maputo corridor that links Swaziland and Mozambique to South Africa. Not only will rail revitalisation improve the quality of rail networks through the region, enabling mining and other industries to transport more steel containers by rail more quickly, safely, efficiently, and economically, but it also represents a paradigm shift in the way SADC railways have been operating. Instead of countries in sub-Saharan Africa working in isolation, the project will drive economic growth through the region and develop what will become a single, unified railway system. The rail revitalisation project is driven by national governments and as such, represents a substantial investment in the region. It is a mammoth project primarily because the rail network has been poorly maintained throughout the region for a very long period of time. 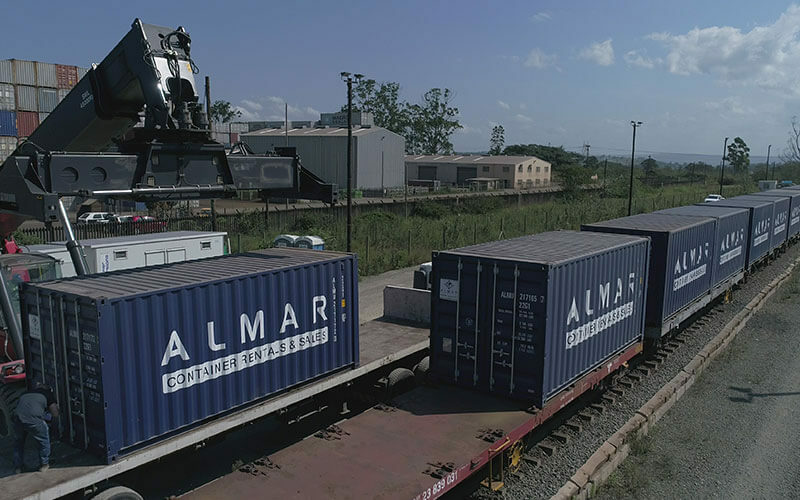 Being part of the rejuvenation of this incredibly important logistics backbone to Africa has been a long-standing dream for the team at Almar Container Group, a leader in the global steel containers industry. As a South African Department of Transport green paper published in 2015 stated, the rail transport sector has had “mixed fortunes” since it was inaugurated way back in 1860. Even though a rail network offers much more efficient transport solutions than road transportation, it has been substantially under-utilised over the past few decades. As a result, one of the major challenges is the “aging, deteriorating or obsolete” state of the existing network. The first project envisaged in the green paper was to promote efficient movement of goods through “industrial corridors” that connect coalfields to power stations as well as the expansion of coal and iron-ore rail lines, and expansion of ports – which is happening now. In recent months, the South African government as well as other SADC governments have become increasingly aware of the incredible potential railways have to inject into the economy of the region. For instance, Zambia has implemented a target of 30 percent of all mining-related exports travelling via rail. State-owned entities in various countries that previously maintained tight control over rolling stock have begun to ease up and allow private operators the space to drive the efficient use of the rail infrastructure. And finally, shippers of cargo are starting to buy into the opportunity with the initial trial shipment showing incredible efficiencies. 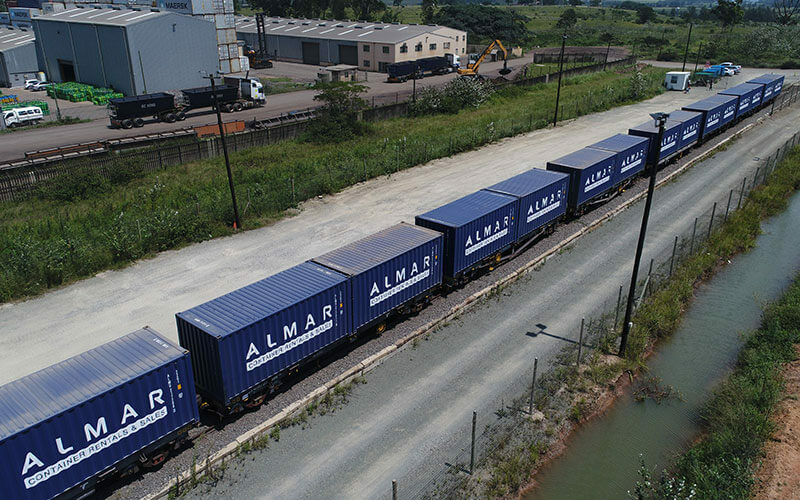 Almar has receiving and collection facilities for steel containers in South Africa, Zimbabwe, Zambia, Tanzania, Kenya and Uganda, which has enabled the company to play a key role in the final roll-out of the rail solution, allowing shippers even more efficiency with one-way rentals. What this means is that there is never any need for shippers to pay for empty returns of mobile containers. 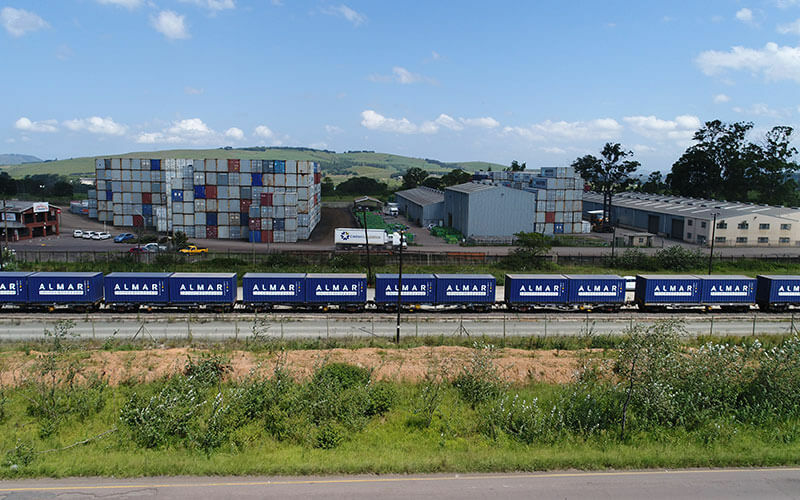 The storage containers for rent service offered by Almar is operational in the north-south corridor, in South Africa, Zimbabwe, Zambia, and Tanzania, where various drop-off points are located. The company has more than 150 of its 20ft containers available along this route. Please contact us for container rental prices.